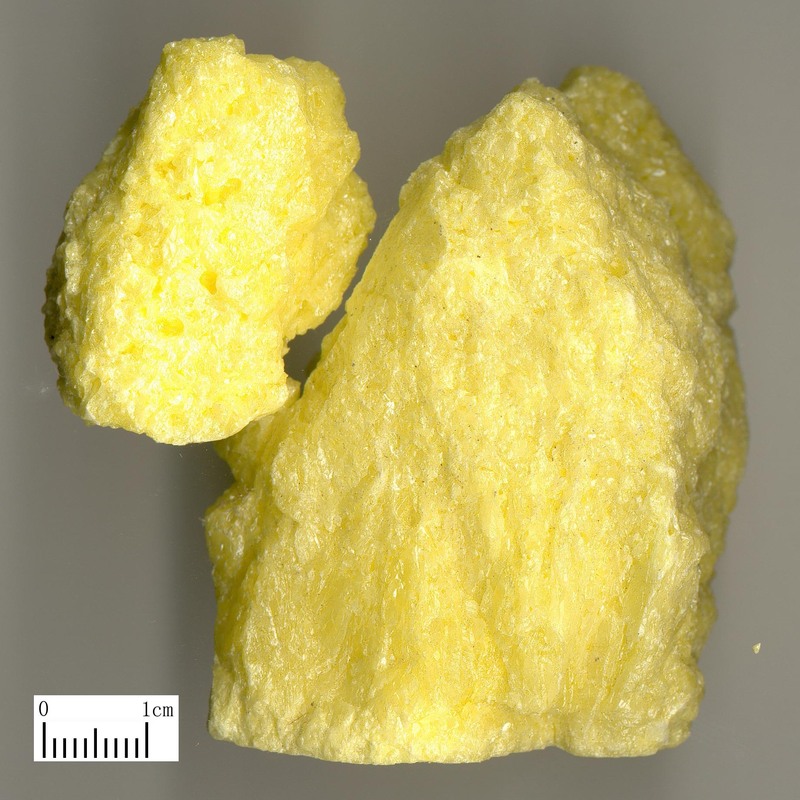 Natural mineral, native sulfur of family sulfur. Mainly in Shanxi, Shandong and Shaanxi provinces of China. Special bad smell and bland taste. Regular in shape, yellow with luster, floppy and crisp in quality. Unprocessed Liu Huang only for external application, cooked with bean curd then dried in shadow for internal application. Sour, warm; toxic; kidney and large intestine meridians entered. Kill parasites and relieve itching and counteract toxic pathogen for external application, tonify kidney fire and strengthen yang for internal application. For external use, this herb can kill parasites and counteract toxic pathogen, dry dampness and relieve itching, especially good at killing sarcoptic mite, so it is regarded as primary herb to cure scabies. It can be singly powdered, mixed with sesame oil for external application, or combined with Da Feng Zi and Qing Fen and other sarcoptic mite killers to reinforce the actions of killing parasites and relieving itching. For stubborn tinea and pruritus, it can be combined with such kind of tinea treating herbs as Qing Fen and Qian Dan to reinforce the actions of curing tinea and relieving itching. For eczema and pruritus, it is combined with dampness-astringing herbs to reinforce the action of astringing dampness and relieving itching, such as Ku Fan, Qing Dai and Bing Pian. For deep rooted carbuncle of yin type, sores and ulcers, it is often combined with buckwheat or flour in powder for external application. This herb can tonify kidney fire and strengthen yang, so it can be indicated for vacuity of kidney yang and syndromes of deficiency-cold in kidney. For kidney deficiency and impotence, it is often combined with yang-strengthening herbs to obtain the actions of tonifying kidney and replenishing fire and strengthening yang to cure impotence. For instance, it is combined with Lu Rong, Bu Gu Zhi and She Chuang Zi, etc. For deficiency dyspnea due to failure of kidney to receive qi, it is often combined with kidney-tonifying and qi-reception-improving herbs. For instance, it is combined with Fu Zi, Rou Gui and Chen Xiang, etc. in Hei Xi Dan from Tai Ping Hui Min He Ji Ju Fang. For constipation caused by deficiency cold, it is often combined with Ban Xia in Ban Liu Wan from Tai Ping Hui Min He Ji Ju Fang. Take proper dose for external application. Ground or mixed with oil for external application. Take l.5~3 g for internal application, made into pills or powder after processed. It is contraindicated for pregnant women because of its toxin. It should not be combined with Mang Xiao, according to nineteen incompatibilities.